We don't even need the next word, because we all know what that means, but we'll say it anyway because it's so tasty... Chocolate! 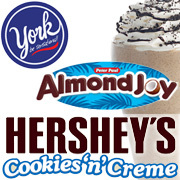 Cookies n' Cream at its creamiest in a blended treat, or add some coffee to the mix with candy cappuccino mixes featuring the brisk and dark chocolate sweetness of York Peppermint Patties and nutty delight of Almond Joy. Whether you prefer it steaming sweet or as a blended ice treat, now there's a smile in every cup!